For the first time ever, scientists have successfully used somatic cell nuclear transfer (SCNT) via the process of therapeutic cloning to generate normal human embryonic stem cells (hESC). 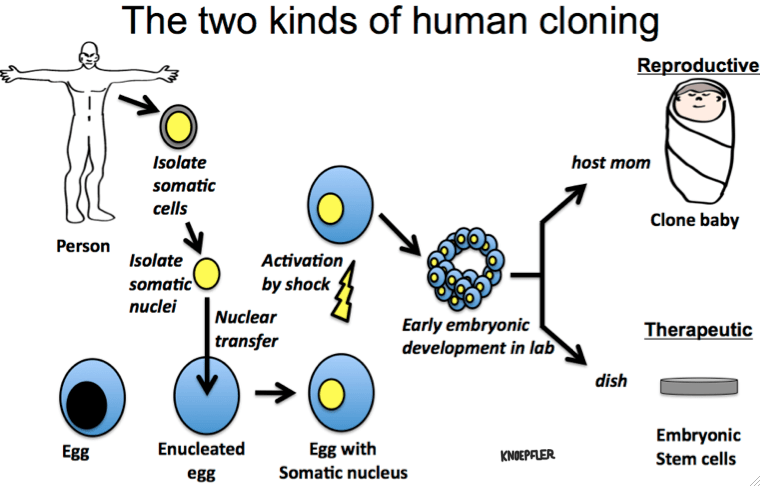 Recall that there are two kinds of human cloning: therapeutic (which is reported in the new paper discussed in this post) and reproductive, which is making an actual new person with an identical genome to an existing person. The latter has never been achieved, but some of us are worried it is coming sooner than most imagine. Today’s paper (Masahito Tachibana, et al.) reporting therapeutic cloning, entitled “Human Embryonic Stem Cells Derived by Somatic Cell Nuclear Transfer” was published in Cell by a team led by Shoukhrat Mitalipov (left) at Oregon Health Sciences Universities (OHSU). It sure seems real this time too unlike 9 years ago with Woo-Suk Hwang. Somatic cell nuclear transfer (SCNT) is a technique in which the nucleus of a donor cell is transferred to an egg cell whose nucleus has been removed, generating embryos that are almost an identical genetic match to the donor individual. For the first time, a team of scientists has used SCNT to produce human embryonic stem cells (hESCs). This milestone, published by Cell Press May 15th in the journal Cell, opens up new avenues for using stem cells to understand patient-specific causes of disease and for developing personalized therapies. A very important part of the paper is the validation of the SCNT-produced hESC lines, which in Figure 6 (see image above at right) looks pretty thorough and solid. ….concerns that this technique (meaning iPS cells) may generate unexpected mutations in the stem cells means that researchers are still keen to find ways to generate hESCs by other means. In the discussion, the authors including first author Masahito Tachibana (pictured at left) further point out the potential problems with iPSCs. Overall, this paper is fascinating and a huge development, but this is a double-edged sword too. On the one hand successful human SCNT could be used to develop personalized hESC from any patient for therapeutic use. This is very important, positive, and exciting. On the other hand, the elephant in the room for this paper is the potential for future reproductive human cloning. Apparently there are still some technical obstacles to cloning primates including humans, but this seems like a step toward making reproductive cloning a reality. What is the difference between reproductive and therapeutic cloning? One is used to make people (or sheep or other animals) while the other, as reported in this paper, is used to make hESCs (or ESCs from other species) with potential therapeutic benefit. My diagram at the very top shows the methodological similarities and differences. Bottom line? I hope that therapeutic cloning produced hESC turn out to be a new way for helping many patients. A big next step will be seeing other labs recapitulate this work. NEW - in the journal Cell: "Human Embryonic Stem Cells Derived by Somatic Cell Nuclear Transfer"